With its mediaeval villages and cypress-lined avenues winding through vineyards, southern Tuscany is the perfect place for a relaxing guided walking holiday.A winding scenic road, just outside the village of Castiglioncello Bandini, is leading to this former cloister, hidden in a seduced valley. Casa Vacanze Podere Santa Pia is located in a strategic position, on a hill overlooking both the Val d'Orcia and the Valle d’Ombrone. There are many things to do in this fascinating oasis of nature and culture. Numerous towns and villages offer a treasure trove of history and art waiting to be discovered. Hiking in the beautiful surrounding hills is a perfect choice, but we also selected some memorable trails a little further away,in the Val d'Orcia, where you can walk through some of the most famous wine growing areas of Europe, the Brunello di Montalcino wine-region. The trail from Montalcino towards Sant’Angelo in Colle is situated north of Podere Santa Pia and starts at the Fortress of Montalcino, ending on the cosy central town square of Sant’Angelo in Colle. This is a walk on the strade bianche or 'dirt road's. 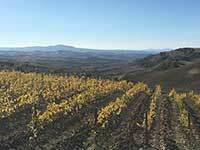 You can enjoy some exclusive wine tours and tasting experiences in the valleys below Montalcino. Plan in advance to arrange a visit to one of these great Brunello wineries in the surroundings of Castelnuovo dell’Abate or on the way to Sant'Angelo in Colle. 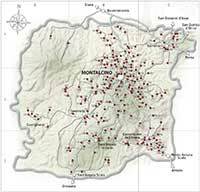 A map with some of the most particular wineries on the southern slopes of Montalcino can be found here. Sant’Angelo in Colle host two excellent restaurants, Il Pozzo and Il Leccio, and in Sant'Angelo Scalo we find da Pino or Caffè Sant'Angelo, one of the best spots for delicious everyday fare. This is an itinerary in the great scenery of Brunello vineyards in the Val d’Orcia between Montalcino, Castelnuovo dell'Abate and Sant'Angelo in Colle. There is no difficulty in following the track. 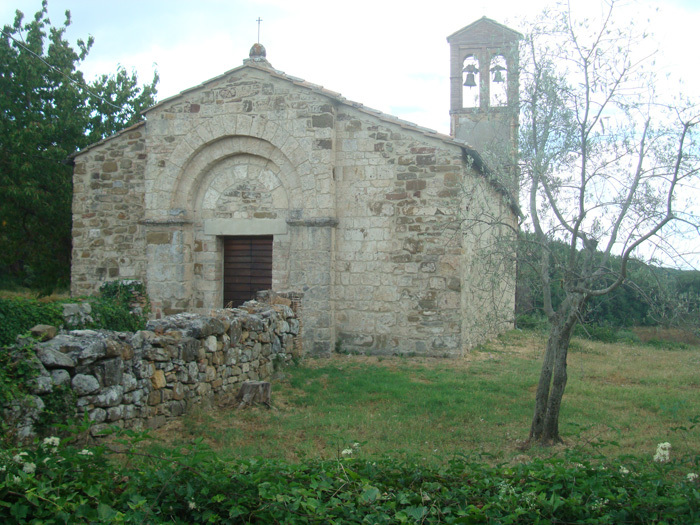 And a visit to the Abbey of Sant'Antimo, one of the highlights of romanesque architecture, is a must. This itinerary can be devided in two tracks, the first going from Montalcino to the Abbey of Sant'Antimo, the second from the Abbey of Sant'Antimo to Sant'Angelo Scalo. The fortress of Montalcino was once Siena's last stronghold, now you can take a walk on the walls, or taste some Brunello wines in the enoteca inside the fortress. 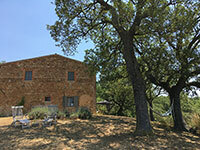 You are in the midst of some great wineries: Poggio di Sotto, Ciacci Piccolomini (Località Molinello) and Uccelliera Di Cortonesi Andrea (45 Localita' Pod. Uccelliera) are all nearby. Or check out Mastrojanni, owned by the coffee producing Illy family. This stretch starts at the very impressive Romanesque Abbey of Sant'Antimo. You walk along dirt roads,again through vineyards and woodlands to the beautiful walled village of Sant'Angelo in Colle, eventually stopping off along the route to visit wineries like Ciacci Piccolomini D'Aragona, la Cantina Mastrojanni, Sesta di Sopra and Lisini further along the road. 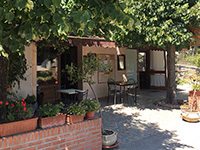 Your walk finishes in Sant'Angelo in Colle, near the Pieve di San Michele Arcangelo, on the square Piazza Castello where two excellent restaurants offer great lunches. You can have lunch at Il Pozzo or Il Leccio, or a little further at Caffè Sant'Angelo in Sant'Angelo Scalo, simply called da Pino by native Italians. Photo by Johannes Gilger, licensed under the Creative Commons Attribution-Share Alike 2.0 Generic license. 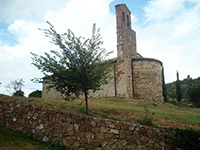 Un viale di cipressi secolari vi accompagnerà alla Cappella di Sant'Antonio abate e alla Tenuta di Montecucco.